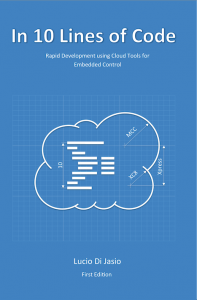 “In 10 Lines of Code: Rapid Development using Cloud Tools for Embedded Control”. This is really meant to be a complement to the “Rocket Science” book I published last year. In fact while the Rocket book was all about the “why” of the new Core Independent Peripherals, many wrote to me asking for more examples and “hands-on” demonstrations of the CIPs use and benefits. The launch of the MPLAB Xpress online IDE gave me the perfect opportunity to combine the ease of use of the new cloud toolchain (and a new board) with the Core Independent Peripherals. So I set off preparing 15 new projects carefully chosen to bring the reader step by step up a gentle learning curve. When I published the book on Lulu (in April), I posted all the source codes on Github and then started adding them gradually to the MPLAB Xpress Examples repository. While the book eventually ended up listing 20 projects, I kept developing more as time went by, so stay tuned as eventually a few more “bonus” ones will end up spilling in these blog pages. Also, I really tried hard to keep the cost of the book as low as possible (limiting it to a max of 150 pages this time, if you now how hard it is for me to keep my writing short and focused …) and due to my son’s pressure I resolved to select a more echo friendly choice of paper (less whitening chemicals). I hope you will appreciate my efforts too! This entry was posted in PIC16, Tips and Tricks and tagged Books, CIPs, Click, MCC, PIC16, RocketScience, XPRESS. Bookmark the permalink.